Have you made these cute little acorn cookies yet? They are super easy to make. 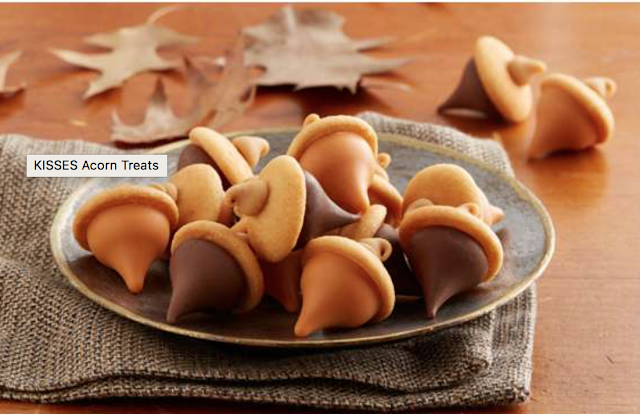 The perfect treat for Halloween, Fall and Thanksgiving. Also an excellent treat to put in the kid's lunchbox When we made these yummy cookies, the children helping that day were 3, 4, 6, 8 and 10 years old. Fun was had by all! 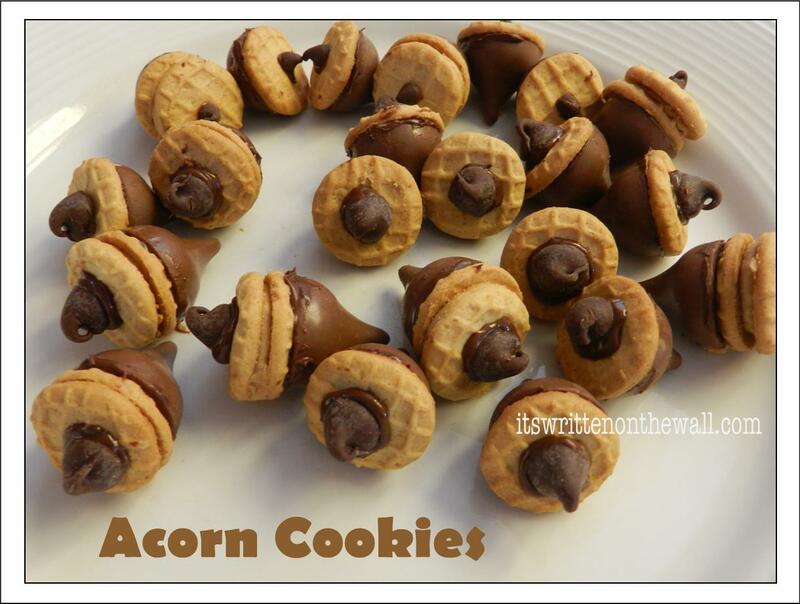 We made our acorn cookies with the a Caramel Hershey Kiss. They were amazing! You could also use the new Pumpkin Spice Kiss or a Chocolate Kiss. Here are your ingredients. 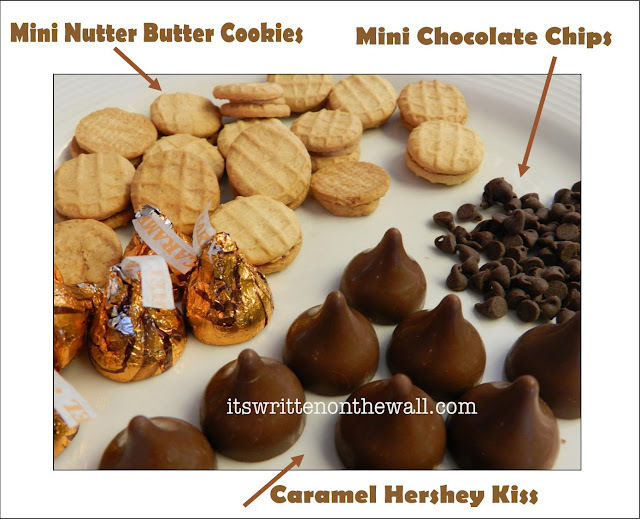 (1) Mini Nutter Butter cookies (2) Caramel Hershey Kiss and (3) Mini chocolate chips. 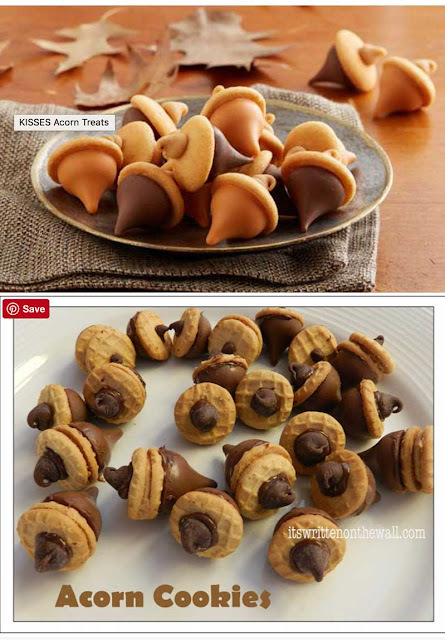 Using just the top of a Nutter Butter cookie looks great and you can get more acorn cookies per bag. The creamy center of the cookie comes right off. We wanted to use regular sized chocolate chips (because that's what we always have on hand) I think they looked nice too. The butterscotch mini chocolate chips are another choice. 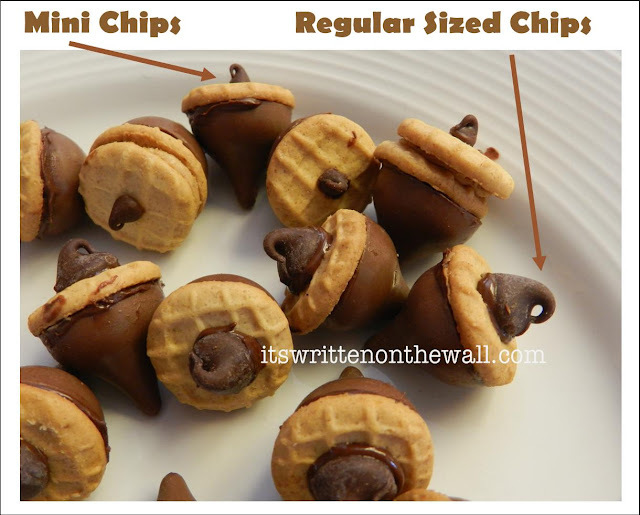 Melt your chocolate chips in a double boiler or in a microwave and use as glue for the kiss and chocolate chip on top. You know, it might be easier to put your melted chocolate in an icing bag and just put a drop of glue (chocolate) on the top and bottom of the cookie and then add the Hershey kiss and the chocolate chips. That way there would be no excess. I found I had to do all the tops (mini chocolate chips) first and let them set and then do it again with the Hershey Kiss. Instead of using melted chocolate couldn't you just put the nutter butters on a cookie sheet and warm them up in the oven? Or use chocolate frosting/icing already in the tube? Do you use icing or melted chocolate to keep the kisses and nutterbutter together? yes i am wondering a little about the "glue" too. did you melt some chips or icing. i love this idea and will make it work. thanks for sharing!